I was asked by my school to make the invitations and put together the name plates, table number labels and seating plan display for the prom this year. As the prom was yesterday evening, I can now safely share what I made. The theme colours were blue, silver and off white and the school hall looked amazing when decorated in these colours. A great team worked really hard all day yesterday to make sure that everything was ready; by that time my job was well and truly over and I could enjoy the celebrations. I needed to come up with an idea for the invitations which would look impressive and not take too long to put together as 80 had to be made. The 'Let's Party' die from the Girls Night Out sentiment collection by Tonic Studios seemed to fit the bill perfectly. I tried out several combinations of blue and silver. The panel on the left was the preferred choice and this was used on the final invitation which was made from a piece of A5 (21cm x 14.8cm) linen effect pearlised off white card folded in half. I confess that I only designed the stationery and cut all the card to make the name plates, invitations, table number panels and seating plan panels. A good friend of mine die cut all the Let's Party pieces and a technician at school actually glued everything together, for which I am extremely grateful; the art teacher provided the handwritten touches. I think we made a great team and I won't mind making this an annual task if asked again. The name plates were made from the same off white linen effect card, but this time an A6 piece (14.8cm x 10.5cm) folded in half. A piece of the dark blue card (4.2cm x 7.3cm) was matted onto a piece of silver (4.7cm x 7.3cm) and the names were written on in silver pen. Unfortunately I cant show you any of these as I didn't take a picture before the names had been written on them. The table number labels and seating plans were made in exactly the same way. A piece of A5 blue card as the base with a slightly smaller piece of plain off white pearlised card (20cm x 13.8cm). Before they were matted together, a length of dark blue 1" satin ribbon was wrapped around the top of the off white card and a heart embellishment provided the finishing touch. A dark blue Sharpie pen was used to add the table numbers and names. 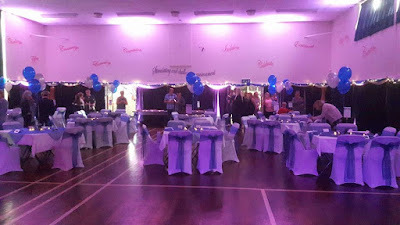 The table number panels were made double sided and each one had a matching seating list which was arranged on a board at the entrance to the hall.